Take a look at the photo to the left. 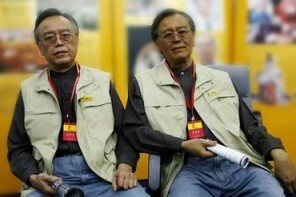 These are not twin brothers, or some sort of photo trickery. As it so happens, one of these men is a robot. Yeah, I don’t know which one is fake either. However, I think you should know that this technology is available. Just so you can be free of your Stepford Wives nightmares, this robot cannot walk and talk, or be some evil version of you who will go about doing bad while you take the blame. No, what you are looking at is one of those animatronics like you would see at Disneyland’s Pirates of the Caribbean ride, but a bit more realistic. The best you could hope for is a figure that would sit there and move its head and eyes in a realistic fashion. The might be enough to fool a boring college professor. This technology has been developed by the Xian Chaoren, a model company by the Shaanxi Provincial Department of Arts. It specializes in simulated silica gel figures, otherwise known as super-realistic sculptures, which is good for museums, or any other related design and production industries. My source doesn’t list how much it would cost to duplicate yourself, but you don’t really think that something like this could come cheap, do you? Neither do I. I suppose that if someone were willing to make a museum for me, I would probably want a robot version of me, rather than be immortalized in wax.